Home > Uncategorized > Treston White, Student Employee of the Month! Treston White, Student Employee of the Month! 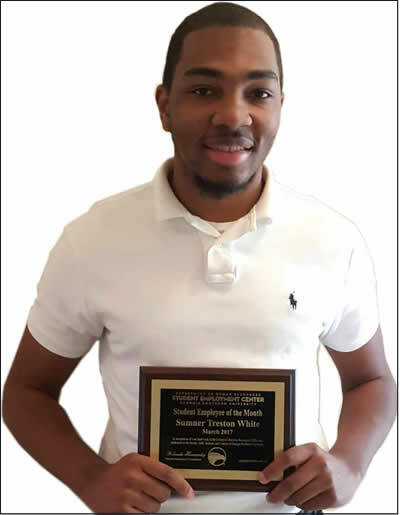 We are proud to announce that Zach S. Henderson’s own Treston White has been named Student Employee of the Month by Georgia Southern University’s Human Resources department for the month of March. Treston has worked in the Collection and Resource Services department of the library since his freshman year. His work is consistently of the highest quality. In the words of Mrs. Lillian Brown, his supervisor, “in the four years with us, he has championed every assignment.” His patience and easy-going nature make him a pleasure to work with while his efficiency and reliability make him a star employee. Congratulations, Treston, for this well-deserved honor!